Although known today mostly as a flavoring for milk shakes and chocolate-covered malt balls, malted milk made its first appearance in the 1880s as a substitute for human breast milk. At that time, breastfeeding babies began to lose its appeal among both mothers and pediatricians. For mothers, who were beginning to find jobs outside the home in large numbers, having to breastfeed babies made it difficult to juggle their work and home lives. Infant nutrition was one of many causes advocated by Progressive Era women’s groups, a national social movement through which women gained a larger voice in social and political change. Shown here are the five officers of the Newport, RI Women’s League in 1899. Image via Wikimedia Commons. One response to these demands among mothers was to try to put their babies on regular feeding schedules. Doctors supported this effort, because they believed it was important for babies to learn discipline from an early age. In the words of Chicago’s Department of Public Health, any mother who breastfed or held her baby whenever it cried might end up with a “resisting, angry and contrary tyrant.”  Yet the plan to move babies to more regular feedings in the 1880s proved difficult to put into practice, and the problem appeared to be their mothers’ inadequate supply of breast milk. Doctors and mothers noticed that babies often seemed to be hungry, apparently unsatisfied by the amount of breast milk they were receiving. The worry that breast milk might not suffice for babies’ nutritional needs opened to the door for other products to meet then need. One such alternative was fresh cow’s milk, which increasingly became available in large cities like New York and Chicago, where the milk could be delivered daily from farms that formed a belt around the city. But cow’s milk had its own problems. It spoiled rapidly in only a few days, especially in summer, even when stored in household iceboxes. Furthermore, milk sometimes was adulterated by farmers or the operators of the dairies that distributed milk to increase their profits (see Babcock Butterfat tester). And finally, milk could harbor dangerous infectious diseases like tuberculosis. Horlick’s Malted Milk advertised itself for “infants and invalids.” Image via Flickr. The process that William Horlick registered with the U.S. Patent Office in 1883 was designed specifically to avoid the problems of fresh cow’s milk and “render such food free from all souring tendency,” as the patent application put it. Horlick mixed equal parts malted barley and ground wheat, mixed these with milk, and then let the resulting mash sit for half an hour at 150oF. This allowed enzymes in the malted barley to break down starch in the wheat and barley, yielding simpler and more easily digested sugars. Then the entire mixture was ground up and vacuum dried, which left a powder that could be sold and used by mixing it with water. Horlick’s Malted Milk was by no means the first, nor the only, commercial infant supplement. As early as the 1860s, the German chemist Justus Liebig had begun marketing what Liebig believed was the perfect infant food, based on his own chemical analysis of human breast milk. Other competitors also entered the market in the 1880s, most notably the infant formula marketed by the Swiss chemist Henri Nestlé, which consisted of condensed milk to which malted grain and sugar had been added. Horlick’s held its own against such competition, maintaining a dominant position in the American market for infant supplements into the early 1930s. Nestle was one of Horlick’s competitors. Image via Wikimedia Commons. In the 1930s, however, Horlick’s ran afoul of the powerful American Medical Association (AMA). Beginning in the 1920s, the AMA tried to assert more control over drugs and other products that were directly marketed to the public. It did so by allowing them to display an AMA “seal of approval” on product labels and advertising, if the manufacturers agreed to direct their marketing only to doctors (in medical journals, for example) instead of directly to the public. Horlick’s, which had long maintained a successful advertising campaign to the general public, refused to submit to the AMA’s new requirements. As a result, in 1933 the AMA publicly revoked its seal of approval from Horlick’s Malted Milk in its widely read Journal. The company lost its gamble that their sales would continue without the AMA seal of approval. 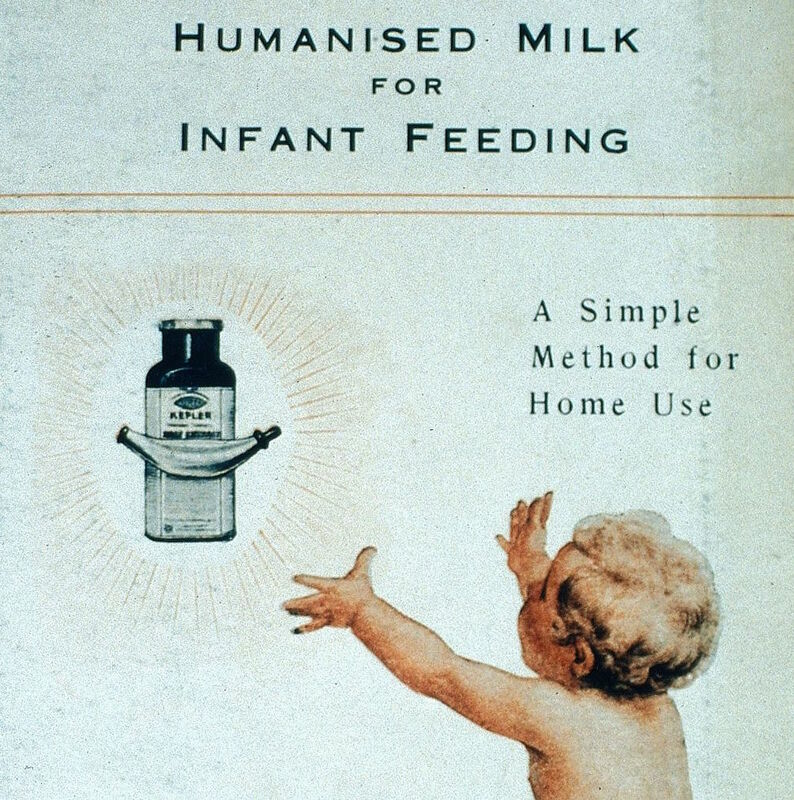 Once the seal was removed, Horlick’s sales of infant formula began to decline. Jaqueline H Wolf, Don’t Kill Your Baby: Public Health and the Decline of Breastfeeding in the 19th and 20th Centuries (Columbus, OH: Ohio State University Press, 2001), pp. 34-36, quoted on 35. Barbara Gutmann Rosenkrantz, “The Trouble with Bovine Tuberculosis.” Bulletin of the History of Medicine 1985, 59(2):155-175. United State Patent No. 278,967, dated June 5, 1883. Rima D. Apple, Mothers and Medicine: A Social History of Infant Feeding, 1890-1950 (Madison, WI: University of Wisconsin Pr., 1987), pp. 92-94. Featured image: courtesy of Wikimedia Commons.